Run this network administrator daily tasks checklist when conducting assessments and reviews of equipment and software to make sure all processes have been clearly documented. In this Process Street network administrator daily tasks template, we provide a simple documentation system to utilize both as a checklist for undertaking the tasks and as a way of evidencing that tasks are being completed. This process involves the regular checks a network administrator would be expected to complete on a daily basis while including further tasks like the backup of files or data. 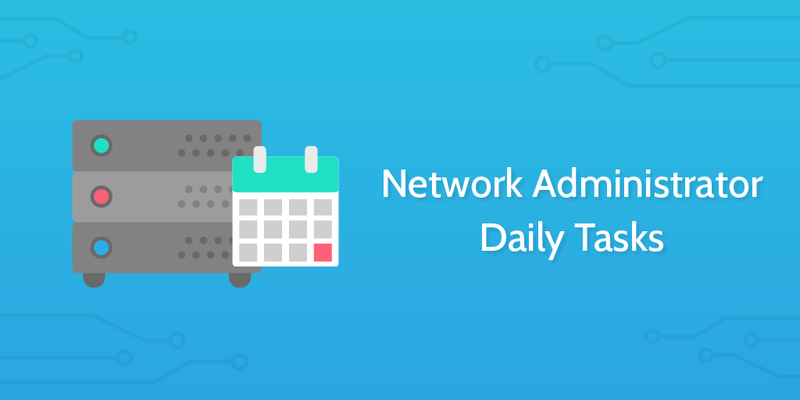 The daily life of every network administrator will be different and as such this Process Street template is entirely editable for you to tailor to the needs of your organization. Simply add the template to your Process Street account and click to edit the template. There is a wide range of different form fields you can add into your template as evidenced by the example form fields found throughout this process. We recommend utilizing form fields where possible to record information. All data entered into form fields within Process Street checklists is saved and accessible within the template overview tab. This tab saves the data in a drag-and-drop spreadsheet format which you can also export as a CSV file. By entering relevant information into form fields as you work your way through the process, you are able to actively document your process for future review. All activities within the organization's operations are reliant on the network administrator keeping everything running smoothly. The job of a network administrator often goes without significant praise as people see a functioning network as being indicative of a state of normality rather than as a series of successes by the admin. Nevertheless, without a well-performing network administrator, the company's operations could be put at great risk. This risk could come from both an operational or a security angle. The network administrator is the bedrock the rest of the services are built on. If you're not someone with knowledge of what a network administrator does, watch this snazzy video below. One of the key recurring roles of a network administrator is to monitor the various logs. Use the form field below to leave your notes. Make sure to check your security logs as a first defense against attacks on the system. Make sure to check the health of the system by scanning the system log for warning and error messages relating to hardware issues and network failures. As the last of the log checks, review the directory services log on the domain controllers. You can watch this related video on filtering views to improve the ease of your review process. It's vital to backup your system files on a regular basis. It's likely you have an automatic process in place to handle this. If so, simply check that the backup has been successful. If not, use this task as an opportunity to back up your files. You can read more about backing up files and related resources from MIT: Why You Should Backup Your Files. Encrypt backups that contain sensitive data. Keep extra backups off-site in a secure location (in case of property damage). Verify your backups to make sure files are retrievable. Sanitize or destroy your backups (e.g., tapes, CDs) before discarding them. Or you can watch this video below for a walkthrough of backing up on Windows Server 2008. Backing up your active directory is much the same as backing up any other files and ultimately serves the same purpose. In this task, either check your files have been successfully backed up, or back them up now. You can watch this longer walkthrough below of how to do this on Windows Server 2012. Check for memory usage and record anything important in the form field below. Check for system paging and record anything important in the form field below. Check for CPU usage and record anything important in the form field below. Make sure there is adequate free space within hard drives. If space is below an acceptable threshold, take the appropriate action to deal with this potential problem before it creates difficulties. Use the form field below to record any notes. Lastly, make sure you review and assess the equipment for any warning signs. This may be looking for amber lights or alarms, or it may just be an inspection of any physical damage or deterioration. Use the form field below to document anything of note which you find.